The gloomy recesses of a cave are inaccessible to all but a select band of hardy explorers, and little light is ever shone on this extreme branch of the sport. 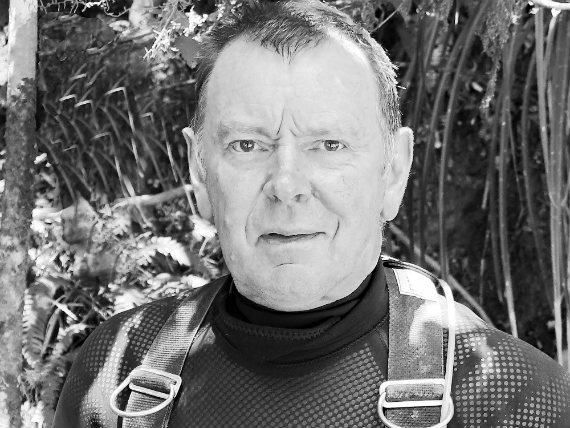 But if there’s one person who has done more than most to enlighten us and comes nearest to being a celebrity cave diver, it’s Martyn Farr. He has been at the forefront of the sport for decades, and is the go-to authority on the subject for the media or after-dinner speech writers. 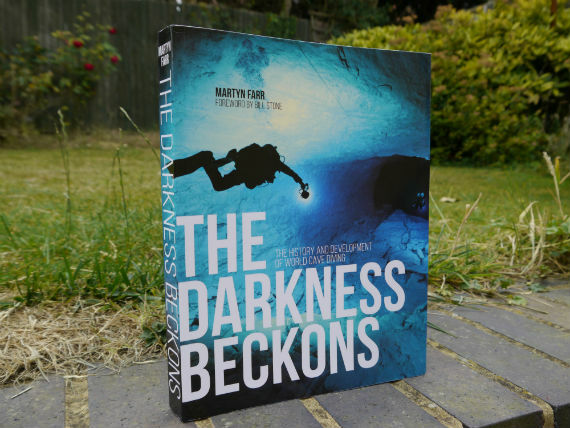 In comparison to caves that form over thousands of years, Martyn’s seminal history of cave diving ‘The Darkness Beckons’ is a mere newcomer at 37 years old. Yet this latest edition brings the year 2000 version bang up to date with a look at the latest technical developments and analyses of cave systems opened up by increasingly emboldened bunch of hardy explorers. Martyn has signed up with specialist publisher Vertebrate (www.v-publishing.co.uk), who have an impressive portfolio of books about extreme sports and exploration. They have wisely refreshed the 2017 edition by inserting lush photography that befits the hi-tech era and makes the book feel much more current. There has been a surge in interest in cave diving, helped by the boom in ‘technical’ training, the internet and our hunger for overseas travel. As recently as twenty years ago caves were the realm of home knit-wearing eccentrics with beards; today, caves and caverns like the Mexican cenotes draw in photographers and adorn the pages of glossy travel brochures. While there may be an increased interest, caves remain off limits to most of us. The Darkness Beckons tells you everything you need to know – it’s part historical, part adventure and part reference manual. 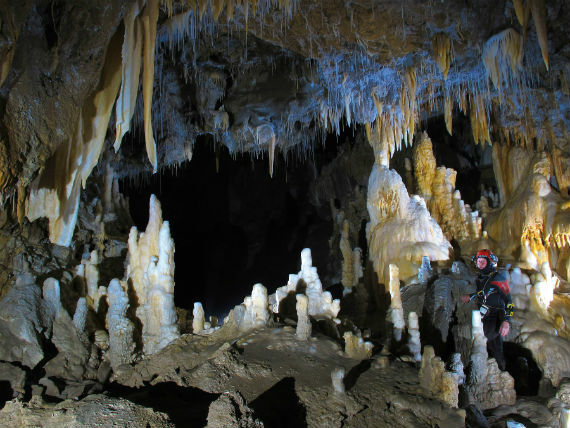 The author sensibly uses the first few chapters to look at the pioneering decades, including pre-scuba years when cavers across Europe began using technology to explore flooded underground systems. The second third of the book is organised by region: beginning in the British Isles (Martyn’s home turf), each chapter takes us around the world in Lonely Planet guidebook fashion. The author’s matter-of-fact style is easy to read and has the effect of taking much of the drama out of the subject. Reading through the chapters on diving caves in Florida or Mexico or the Canary Islands makes them sound extremely inviting, and not the eerie holes of my imagination. Perhaps it’s time for some cave diving training…. Current day explorers have the benefit of highly detailed maps, which are useful when trying to envisage these confusing underground systems. Cave diving is a dangerous pursuit and many of these systems were figured out the hard way, with loss of life. Martyn is blunt about the inherent dangers of his beloved sport and doesn’t shy away from discussing some of the more noteworthy catastrophes. The well-documented deep cave diving attempt of Dave Shaw to recover a body in Bushman’s Hole is one such example. If you think about extreme sports – skydiving, mountaineering, motorsport, etc – you’ll note there isn’t one that hasn’t been commercially exploited. 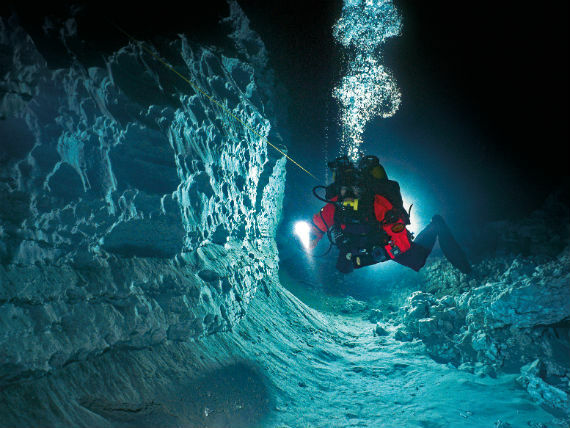 Cave diving is one of the few extreme sports left untouched, and remains unknown to most, literally beneath our feet. Thanks to the passion and expertise he injects, Martyn Farr’s brilliant book brings it to life for all. It is well worth the time for wannabe cave divers and armchair explorers in search of thrills alike. The Darkness Beckons (2017) is published now by Verterbrate, www.v-publishing.co.uk priced £25 RRP. ISBN 9781910240748.